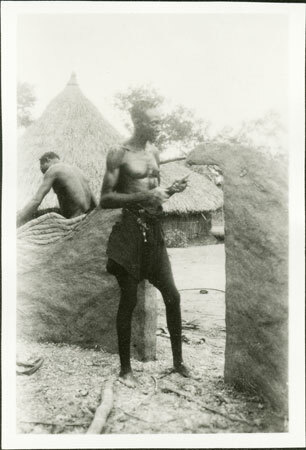 Two men building up the clay inner wall of the common hut type known as gbuguru or gbasendeyo, working on the section over the entrance to the hut. This image shows how the walls are made, with relatively thin strips built up in layers by hand. Morton, Chris. "Building clay wall of Zande hut" Southern Sudan Project (in development). 03 Jan. 2006. Pitt Rivers Museum. <http://southernsudan.prm.ox.ac.uk/details/1998.341.439.2/>.